George Jones, one of country music's most iconic and long-standing figures, passed away this morning (April 26) at the age of 81. His publicist confirmed that the musician died while at the Vanderbilt University Medical Center in Nashville, TN. While the cause of death has yet to be revealed, Jones had been brought to the facility on April 18 after suffering a fever and irregular blood pressure. Born in 1931 in Saratoga, TX, the man nicknamed "The Possum" taught himself to play guitar as a teenager, and began playing the streets of Beaumont, TX. He kicked off his recording career with the "Why Baby Why" single in 1955. Following nearly a dozen more singles, the baritone-voiced artist nabbed his first chart-topper with honky-tonk hit "White Lightning" in 1959. It wouldn't be his last, with other number ones including "She Thinks I Still Care," "The Grand Tour" and his Grammy-winning 1980 ballad "He Stopped Loving Her Today." His last single was 2008's "You and Me Time" with daughter Georgette Jones, a track off the rarities compilation Burn Your Playhouse Down – The Unreleased Duets. Aside from his music, Jones was infamous for his bouts with alcoholism, scattered drug charges, and his troubled third marriage to singer Tammy Wynette, with whom he also recorded three number one hits. Jones also had tendency to cancel concerts, which earned him another nickname, "No Show Jones." Many of these topics were handled head-on by Jones in his 1997 memoir I Lived to Tell it All. Despite the faults, Jones was still a country music figure beloved by fans and contemporaries. Waylon Jennings sang of the star in his song "It's Alright": "If we all could sound like we wanted to, we'd all sound like George Jones." A number of musicians took to Twitter today to say goodbye to the Possum. 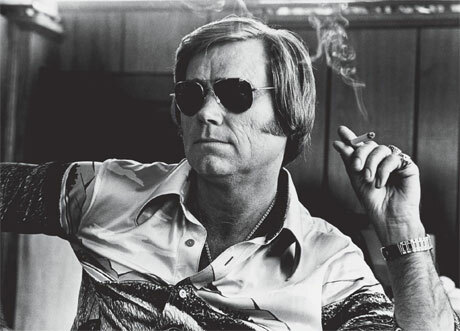 "Swift and positive rebirth #georgejones The quintessential country voice," k.d. lang wrote. "Bourbon and chocolate. Thank you George. I truly am indebted." D.O.A. singer Joe Keithley tweeted his condolences, saying: "Really sad to hear that #GeorgeJones has gone to that #GrandOldOpry in the sky No Show Jones your style and talent will be sorely missed RIP." Country star Blake Shelton posted "Really REALLY bad news. We've lost a country music legend. And I've lost a hero and a friend. Goodbye George Jones...", while Jason Aldean added: "So sad to hear abt the passing of George Jones. Country music has lost one of our pioneers & legendary icons. You will never be forgotten." Merle Haggard also tweeted, "The world may have lost the greatest country singer that ever lived," while Simone Schmidt (from the Highest Order/One Hundred Dollars) wrote a touching tribute to Jones here. You can read an interview Exclaim! did with Jones in 2005 over here.